The newest Captain in the Water Taxi family! Officer on deck! West Seattle Water Taxi riders already recognize deckhand Nick Williams, and know him for his great sense of humor and unflappable and easygoing attitude. Get ready to salute, though. 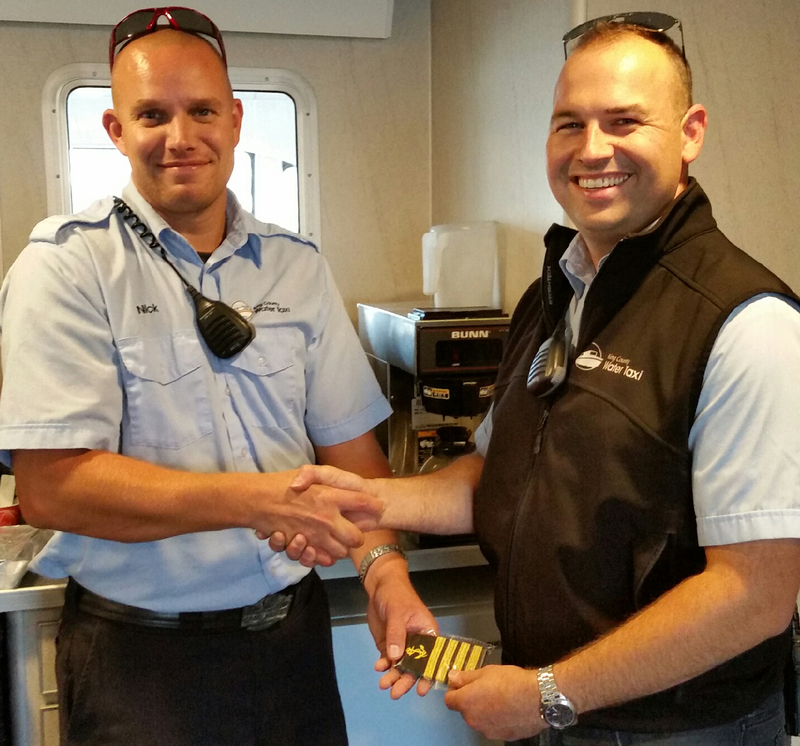 Nick recently received his captain’s license from the United States Coast Guard, and last week started driving the West Seattle route as a relief Captain for the King County Water Taxi. “It was great to have all the support and all the compliments when I started driving. But it also will be great to not get as wet!” Nick said. Nick was first hired by the Marine Division in July 2010, but shifted to spend three years serving on active duty with the United States Coast Guard. Nick rejoined the Marine Division in October 2014. Nick is now the tenth of our 12 deckhands that work the summer schedule on the Vashon and West Seattle routes that have their licenses and can ‘bump-up’ to relief captain when needed. This helps the Marine Division efficiently maintain a pool of on-call deckhands who can step up and captain the vessels when needed. Having a deep bench of capable captains keeps the Water Taxi service reliable and dependable for riders. For deckhands, this gives them the opportunity to ‘bump-up’ to keep up their Captain skills and position them for future captain recruitment. October 6, 2016 in News, Operations.